Race report: Conditions were awesome. They nailed the tide perfectly. The course, which runs parallel to shore, was on the beach when we got there 2 hours before to register! I took the inside line off the start, at the front. The lead guys were going ballistic, but I stayed w/their feet until the first turn. Then we were into a heavy current. The kind of current you see things zing by on the bottom. My lake has a current so I found 6Bk seems to hold position better. So I 6BK'd the whole race actually. I got dropped into a "chase" pack of one (me). No man's land . There was no keeping up, simply don't have the lungs for that front pace. At the turnaround I actually wasn't too far behind my buddy & the leaders. But down the back straight with the current, they were gone. So I just kept a tempo pace, 6BK to bring it home. The remainder of the race was behind me by quite a bit. I got out of the water feeling like I had left something on the table. It was the defibrillator . Here's my buddy Dr. Owen Brown, first overall. No wetsuit. He trained hard and ripped it. 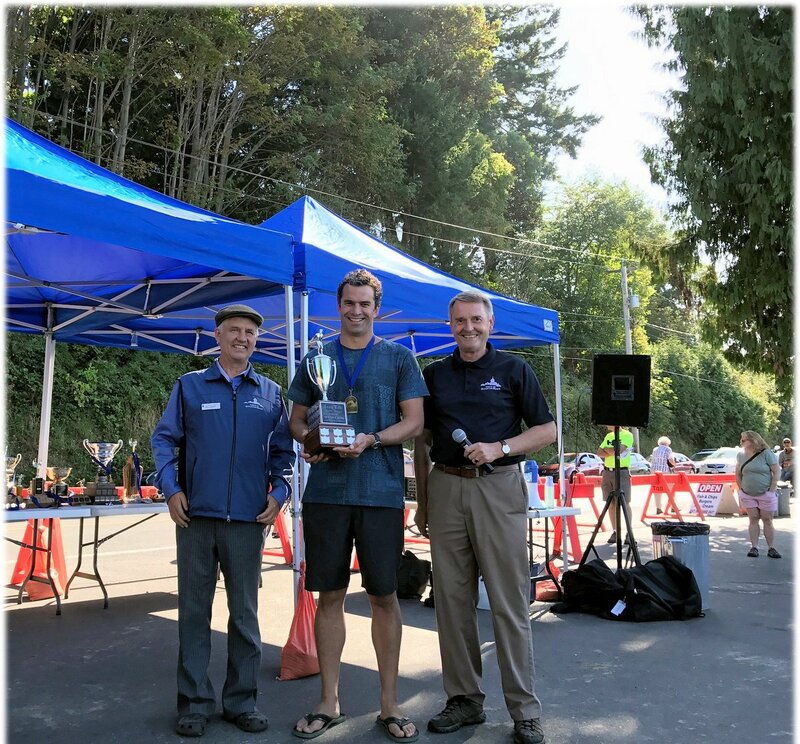 Re: Qualicum Ocean Mile Race 59th running! Congragulations, I really appreciate the amateur swimmers competing in any events, no matter your level or age group, every challenge has hard working behind the scenes. Hope to meet in European Championships in Slovenia. Here's a news article. Owen (winner) can be seen munching in - green cap at about 00:40. In the top 4 were Owen, Trevor then the two kids - which are fast little guys. I followed them in 5th overall, 2nd in the Open class. Well done! What is your average pace per 100m? Then I thought well what about a sprint w/fins? And that worked out to 1:05 /100M leg limited. In other words I bonked due to my legs unable to keep pushing. My pull could have gone all day long. Leads me to believe I need to clean up the frontal drag situation.